The breathtakingly detailed sound and dynamic feel of the G1 provides the pianist with every possible shade of musical expression. With technology derived from the award-winning KRONOS piano sound engine and a precisely engineered keyboard that responds perfectly from gentle pianissimo to powerful fortissimo, Korg have created a unique digital piano. The beautifully crafted slim-line cabinet of the G1 is a result of Korg’s unique history of musical instrument design, there is no compromise between superb sound and impeccable design. Korg have selected the sound of three of the world’s finest concert grand pianos from manufacturers in Germany, Austria and Japan (Steinway, Bösendorfer and Yamaha). Multiple sample layers are used to achieve ultimate realism. The three main pianos in the G1 analyze performance dynamics to seamlessly select between different sets of piano samples. From a delicate pianissimo to a powerful fortissimo, the player’s expression is realistically reflected in the sound. 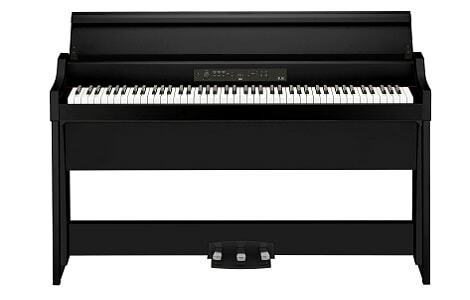 Damper and String Resonances The three concert grand pianos in the G1 realistically recreate the ‘damper resonance’ effect that is produced by the sympathetic resonance of the strings in an acoustic piano. Strings will resonate in sympathy when notes of corresponding pitches are played when the damper is lifted. String Resonance is an essential characteristic of the overall sound of an acoustic piano and features in the three concert grand pianos in the G1. Key-off Simulation Key-off simulation recreates the sounds that are produced when the player’s fingers lift off the keys. Bluetooth audio support (G1 Air only) Connect a Bluetooth device such as a smartphone to the G1 Air and enjoy playing the piano along with your stored music or other audio. When you’re not playing the piano, you can use the G1 Air as a powerful Bluetooth speaker system. Premium quality, made in Japan by craftsmen, with Bluetooth audio playback.